No one loves traveling more than yours truly. The hardest part of traveling isn’t picking which shades to rock or deciding how many pairs of shoes I can pack into my carry-on so I can avoid those baggage fees, it’s picking out products. Now, by products you know I mean the curly cremes, oils, and conditioners that will keep my hair happy, restored, and revitalized no matter where I go. With so many companies now making sample and miniature sizes of their products, we have a pretty good selection to choose from whether you’re at a drug store or Target. Here are my key four products I MUST have in my bag before I hit the train, plane or car. We all know it’s important to keep a good shampoo wherever you go. My go-to shampoo is the Carol’s Daughter Sacred Tiare Shampoo which brings all the anti-breakage and anti-frizz for my sulfate-free lovers. My hair often has a mind of its own when I’m traveling and between low oxygen in a plane and running on-the-go from place to place, it needs some extra loving. This shampoo aims to rejuvenate curls that are fragile, frizzy and unruly, which we all know can happen when you don’t have the arsenal of beauty products on your sink. The added bonus of coconut oil, shea, and moringa keeps vitamins in your hair so not everything is stripped from the lack of sulfates. My favorite conditioner to keep tucked away is Mixed Chicks Deep Conditioner. This pint-sized gift from heaven is the conditioner, that revitalizes, softens and awakens my hair. Choosing the right conditioner varies depending on what you’re wanting, but I like Mixed Chicks because I don’t need to put a whole palmful to make a lasting difference when I’m showering, and it detangles my curls like knife through butter. Mixed Chicks not only sells this as a solo, but has a whole trial and travel pack that could knock some of your favorites off the shelf. Where there is a conditioner for the shower…you know a leave-in to keep on hand at all moments is not far behind. The Curls Blueberry Bliss isn’t one the best products on the market for it amazing smell. This lightweight formula repairs, restores, and conditions my curls while helping with breakage whether my hair is wet or dry. It’s infused with mango, coconut, and grapeseed oils so I get the added benefit of vitamins and nutrients in my hair. This is essential since carrying oils can be a pain and you want a product with multi-ingredients. Oh honey, and by honey, I mean this Carol’s Daughter Shine Pomade I fell in love with before I went home to Texas last week. This hair dress not only smells sweet and oddly resembles the yummy treat made by bees, but is especially formulate for those dry, brittle hair days where water just won’t cut it. It’s smooth formula conditions, moisturizes, and controls frizz so you can tame flyaway’s and curls that are roaming loose from the pack. Its texture isn’t sticky or greasy and brushes into each of my curls so I have a defined, but shiny look that I love. What you keep handy when traveling is crucial to maintaining your curly styles when away from the comforts of your bathroom. Even if you can’t find your favorites in travel sized bottles, you can branch out and find other brands who could give compound effects to help your curls. Traveling doesn’t have to be something you dread or avoid because you’re worried that you won’t be able to maintain your curls. Are you traveling soon? 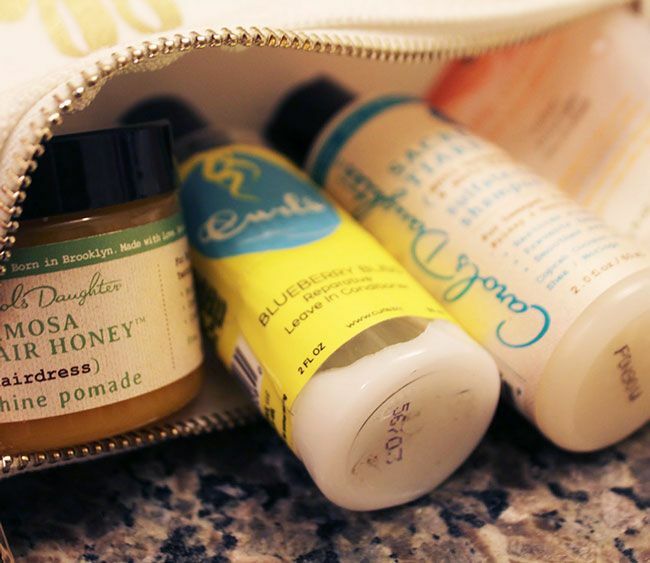 Grab these travel size kits while you're on the go.